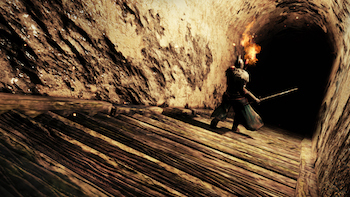 The Dark Souls II team hasn't decided whether the game will come to next-gen consoles or not. Will Dark Souls II ever come to PS4 and Xbox One? Nobody knows... Not even DS2 Director Yui Tanimura. According to Tanimura, next-gen consoles aren't even on his team's radar. When asked if developer From Software plans to use the Dark Souls II PC port to bring the game to next-gen consoles, Tanimura told Edge the Dark Souls II team "hasn't put any thought into this yet." "At the start of development, we felt that there was still a lot of potential that remained unused in Dark Souls," said Tanimura. "I hope this can be seen with the demos and footage that we have released." Tanimura also said that making the game for Xbox 360 and PS3 would allow the team to "deliver the game to fans as soon as possible." Dark Souls II hits Xbox 360 and PS3 March 11.